So a collection of us, a congregation, maybe even a brood so to speak, had a night out, dining at Zest in Kyobashi, where, for some reason, a couple of us decided to feast for the entirety of our pre-defined two hour stay on chicken wings, served in one of four ways. I can’t name those four due to the three hours of karaoke in the intervening period, but rest assured, there were four kinds. I think what attracted us was the fact that they advertised several batches – from ten pieces, to one hundred. 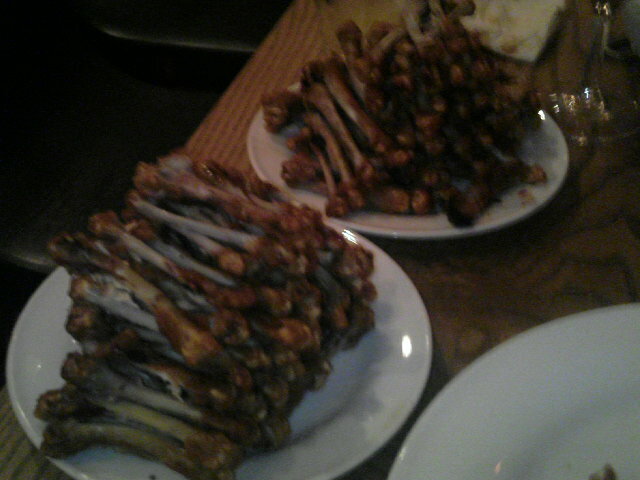 One hundred chicken wings. That’s fifty chickens as far as I can tell, but served on four plates. Anyway, long story short, the two of us took about half of that order, and just kept going. The final tally will never be known, but there were a few. Anyway, fast forward to after the karaoke, tired, covered in various beverages and heading to the lift, but before two of our depleted number fall through the lift doors on the wrong floor, and LH comes up with the correct term for the evening’s gorging: Chicken Genocide. Maybe I should take up the offer of Vegetarian Week at the end of the month.